I sometimes do freelance work in a small chain of Danish boutiques where I have had the good fortune to meet many lovely people from Scandinavia. They are all foodies and we have long discussions about food swapping Malaysian and Scandinavian tips and recipes. One particularly good friend, Maria from Sweden brought Bullar, a pastry in one day for me to try. I was instantly hooked. If you like Danish pastries you must try the neighbouring Swedish version. In actual fact Sweden is the thought to be where this type of pastry originated and in Swedish are known as Bullar from kannelbulle or cinnamon roll. 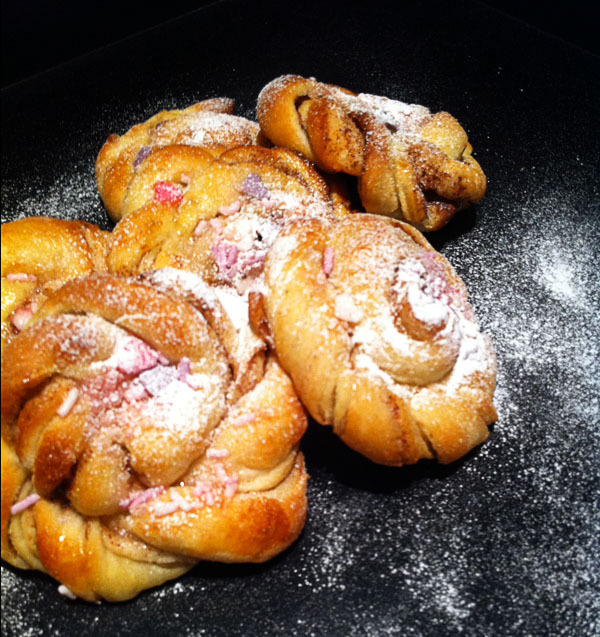 They are so popular that they even have their own day of celebration, the 4th October is Kanelbulles Dag! They are a far less brash, more subtle variety of pastry which doesn't have the high sugar content and sticky glaze always found on their southern or North American cousins. Instead they use pearl sugar which leaves a much cleaner taste. The dough might be described as a cross between a scone and a Danish pastry. It consists of a sheet of yeast dough onto which a mixture of cinnemon and sugar is sprinkled over a thin layer of butter. The dough is then cut and rolled into individual portions and baked. Finally being dusting with icing sugar and/or pearl sugar sprinkled on top. Throughout Scandinavia various interpretations are always on offer which may vary in size and content but certainly not in popularity. They are eaten at any time in the day and chances are if you are invited into a Swedish home you will be offered a cinnamon bun. Warm milk at the temperature recommended by the yeast packet. Mix dry yeast with the milk and a pinch of sugar and let it activate, about 10 minutes. In a KitchenAid mixer, mix yeast mixture, vanilla extract, and melted butter in the bowl. Attach the dough hook and start mixing on low speed. Slowly add flour and salt, little by little, until all is incorporated to the wet ingredients. Knead for 5 to 10 minutes until dough comes clean off the bowl. Lightly oil another mixing bowl and transfer dough over. Cover with plastic wrap and let it rise in a slightly warm place until it doubles the weight, about a couple of hours. Roll out the dough in a form of a rectangle, about 18 inches wide and 1/4 inch thick. Brush dough with softened butter. Sprinkle it evenly with ground cinnamon and sugar. Cut dough lengthwise into strips 3/4 inch wide. Take two strips hold at one end and twist finish by tucking the two ends underneath. Set them on a parchment lined tray, with each roll two inches apart. Let it rise again for one hour. Brush with eggwash and sprinkle with pearl sugar. Bake the rolls in the oven for about 10 minutes or until brown. really nice pictures, I am making these buns this weekend! will let you know how it goes!can I use normal sugar to sprinkle on it?